the second interview in our new series of Boston Handmade member interviews! I'm Chris O'Brien, a digital and mixed media artist in Peabody, MA. Besides Boston Handmade, I am a member of the Salem Arts Association, and between the two groups have met some very inspiring, accomplished artists. My own background is in communications, with a minor in graphic design. I've worked as a graphic designer for years; on my own, in design studios, and in marketing departments. A lot of the artwork I do is based on my own photography and/or graphic designs. I remember the first time I thought I could use my skills in an artistic capacity, rather than as a commercial designer. It was the first time I picked up a Somerset Studio magazine. I thought, "I could do this!" That was in 2002, I think, and although I don't read that magazine anymore, it did provide that first little spark. There are many artists now who inspire me: Bridgette Guerzon Mills, Joanie San Chirico, Maryline Lemaitre, Michelle Caplan, and others, including Boston Handmade members! They all work in different mediums, but what draws me to their work is the levels of depth in their pieces, the layering, which is something I try to achieve. 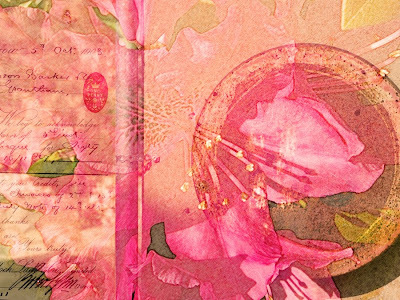 The layers in my pieces come in a variety of ways: acrylic washes, backgrounds of vintage papers, japanese washi papers, digital collage printed with ultrachrome inks, gel medium to add depth, fabrics, fibers, and more. People usually look for a minute, then move closer trying to figure out what the pieces are made from. I describe them as a blend of traditional and digital collage. Just the other day someone mentioned that I might like to try encaustics, and she was right! I just haven't had the time to try yet, but that's next. Right now I sell my work on Etsy, at shows, and in the Salem Arts Association Gallery. In the past I sold some work on Ebay, but not any more. The shows are a lot of work, but I love seeing people's reactions to my work first-hand. And although I'm not the most outgoing person in the world, I'm learning, and enjoying, talking about my work with others. -- My New Year's resolution this year was to get better at doing that, which was one of the reasons I joined both Boston Handmade and SAA, which has helped immensely. Joining Etsy in 2006 was a great step in meeting other artists and buyers. I'm not as involved as some people are with the Etsy community, but I did join a couple of the other street teams (VAST and METSY) which is nice because rather than being competitive, it's artists promoting other artists. And I just sold two pieces to someone in Australia! I don't think that would have been likely without Etsy. My top 5 favorite bands are: Led Zeppelin, Pink Floyd, Queen, Mark Knopfler, Santana and Van Morrison (OK, that's 6! and I'm showing my age), but my favorite song ever is "What a Wonderful World" by Louis Armstrong. My favorite movie is "Life is Beautiful" which is so funny and heartbreaking at the same time. And my favorite writers are David Sedaris and Steve Martin, because of their sharp, satiric wit. I love to travel and last month (June 2008) I visited London, Paris and Barcelona. I took a ridiculous amount of photographs to use in upcoming pieces, so stay tuned!